A far casting, easy to work, deep diving, wont break the bank work horse of a dive and rise jerk bai.. 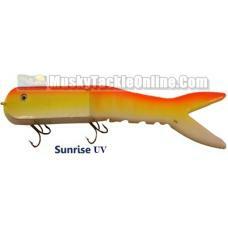 The Intimidator is a dive and rise bait, It features a Polycarbonate square front lip that is glued .. 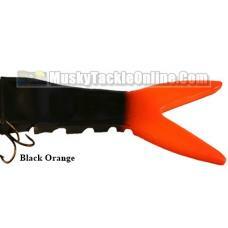 The Dyin' Dawg by Musky Innovations is a hybrid jerkbait with a hard plastic head and a soft plastic.. The Dyin' Dawg replacement tail by Musky Innovations. 1 per pack.. 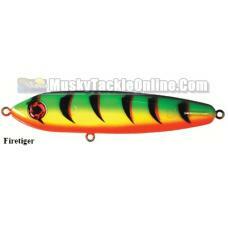 This large fish tail works as a great add on to most jerkbaits or crankbaits that have the rear hook.. The same proven design that made Suick famous but made from an all new High Impact plastic, this Thr..
9" Original Non-Weighted Suick Thriller that began the legacy. 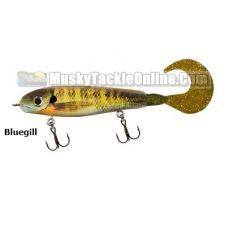 One of the most productive lures ever..
9" Original Weighted Suick Thriller that began the legacy. One of the most productive lures ever des.. 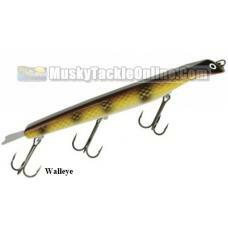 The Wade's Turbo Wobbler is built with the same characteristics as the legendary Wade's Wobbler with.. The Wade's Wobbler is made from select kiln dried wood for buoyancy and consistent density. There ar..